The Lawrence Public Library Friends & Foundation have each voted in favor of merging. We are full steam ahead! Following overwhelmingly affirmative votes from the Friends' membership and from the Foundation board, the merger steering committee is happy to announce that the merged Friends and Foundation organization will take effect January 1, 2020. 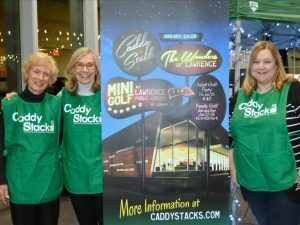 The past several years of forging a close relationship through joint support of the library’s Summer Reading and Read Across Lawrence programs, a shared donor database, and distribution of an annual fundraising mailer and quarterly newsletter has prepared the two organizations to come together stronger than ever. Running a nonprofit is hard work. We're running two! Merging means one board, one board meeting, one tax form, one audit, and one accounting system. That might not seem like much, but this merger will easily save 330 volunteer hours and 150 staff hours each year. In all the areas of overlap in the diagram above, we are duplicating our efforts and diluting our message. Each time we work together our message becomes strong. By sending combined newsletters and annual appeals, donations from these campaigns have grown 6% since 2016. Every year we receive checks made out to the wrong organization, tell donors they are not on the membership list for preview night because they checked the wrong box on their donation form, and have lengthy conversations about the difference between the two organizations. Many donors just want to help the library! Use clear messaging, efficient administration, and a unified volunteer force to support the library. 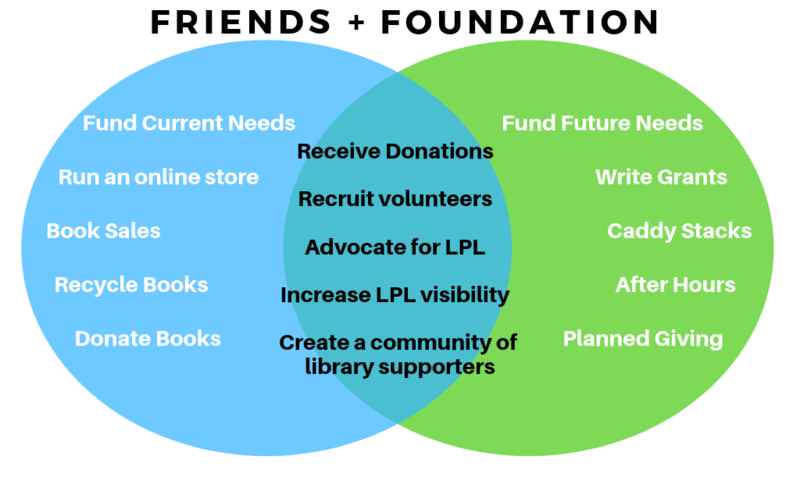 Form an organization that recognizes the value in funding immediate needs and making long-term investments to ensure a strong library, now and in the future. Bring people who love the library together without drawing lines between types of support. 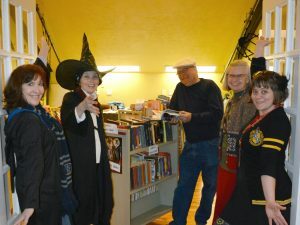 The Book Sale Committee control their own fund, sets their own budget, makes hiring decisions for book sale operations, and determines disbursements to the library in the form of a block grant. Donors have a choice to apply their contribution to fund immediate needs, long-term needs, or both. Cherished community programs and yearly library needs will continue to be funded by the Friends & Foundation. Whether you donate to immediate needs, long-term needs, or volunteer hours, your contribution counts. Everyone who contributes to the Friends & Foundation gets an invitation to membership events. Thirteen volunteers will make up the Friends & Foundation Board. Standing committees include: Finance, Book Sale, Internet Sales, and Membership & Fundraising. Each standing committee appoints their own board representative. Should we continue merging the Friends and the Foundation? A yes vote means we should merge the two organizations, effective January 1, 2020. A no vote means we should not merge the two organizations. Below you will find a link to the draft Bylaws, Policies, and Procedures. These documents are the result of the steering committee's efforts. Thank you, as always, for your dedication to Lawrence Public Library.